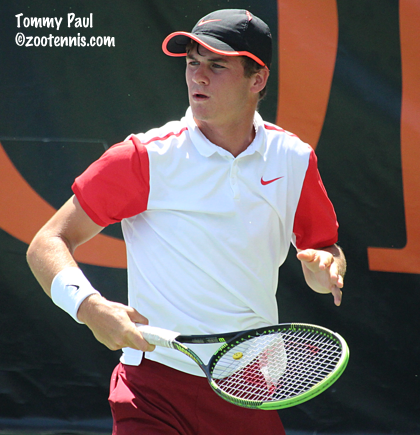 Top seeds Frances Tiafoe and Taylor Fritz moved into the round of 16 with straight-set wins Tuesday in the USTA Boys 18 National Championships, but French Open boys winner Tommy Paul was in trouble before pulling out a 6-7(6), 7-6(2), 6-0 win over No. 19 seed Gianni Ross. 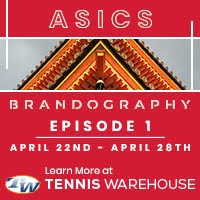 With ideal weather and a full day tennis drawing a large crowd to the Stowe Stadium courts, Paul and Ross had plenty of witnesses to their contest. Paul served for both sets, at 5-4 in the first and 5-3 in the second, but didn't get to a set point either time, as the 16-year-old Ross returned well and had no trouble hanging with Paul from the baseline. "I started a little slow, but he's a good player," said Paul, 18. "He has a good backhand and really good forehand and when he has time, he can rip it. He hits the ball really clean, and was returning really well." Paul dominated the second set tiebreaker, with Ross making some mistakes of both execution and shot selection. Paul closed it out with an ace, and the mandatory 10-minute break between sets did not slow his momentum. "I was pretty tired, so I came up in the stands and laid down for a little bit," said Paul. "Then I went back down on the court to try to get my energy up." "He played a really good match for the first two sets," Paul said. "Then in the third, I told myself to start hitting my forehand return, make every ball and run him to the forehand a little bit." In Wednesday's round of 16, Paul will play another 16-year-old, No. 11 seed Oliver Crawford. "I know him, he beat Will (Blumberg) here last year, didn't he?," Paul said. "We're friends, I know him, he came to USTA one time when I was there, but I have never really been on court with him." Tiafoe advanced over unseeded Alexander Lebedev 6-4, 6-4, Fritz beat No. 29 seed Sameer Kumar 7-6(2), 6-2 and No. 3 seed Stefan Kozlov cruised past unseeded Vincent Rettke 6-1, 6-1. Although it was not technically an upset when No. 22 seed Brandon Holt beat Henrik Wiersholm 7-5, 6-0, Holt certainly considered it one. "Coming into it I thought it was going to be a tough match and one of the biggest wins of my life," said Holt, 17. "I'm speechless right now." Holt, a rising senior, said he never really relaxed, even when he got his second break in the second set. 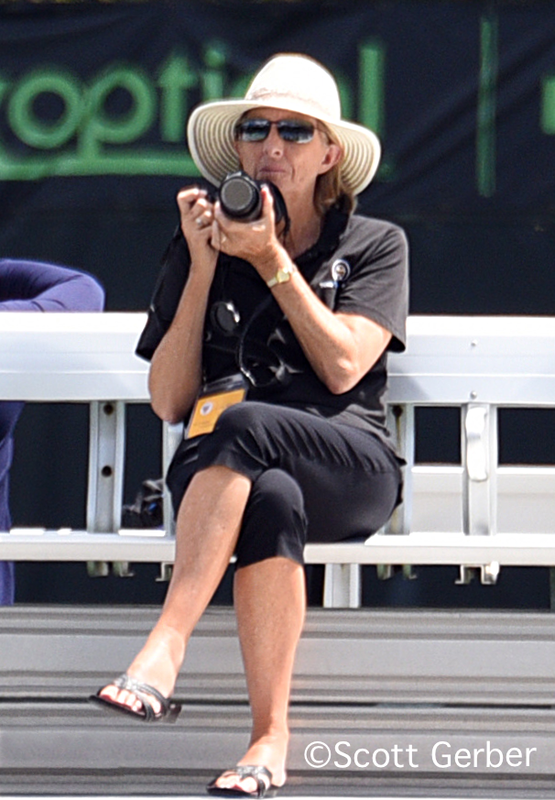 "I never actually relaxed," said Holt, the son of two-time US Open champion Tracy Austin. "In my [Southern California] sectionals, I was up 5-0 in the second set [of the final] and Kalman Boyd came back to 5-4 and I almost lost it. But I don't get super nervous. Everyone says I'm really calm and relaxed, so I guess that's a good thing." Holt is on this trip with his father Scott, but he says although his mother doesn't coach him, she does accompany him to other tournaments, particularly the Winter Nationals in Arizona. "There's pros and cons to having both," said Holt. "My dad's super relaxed and doesn't know as much about tennis, obviously, so it's more of a laid-back feeling. But with my mom, everything's set, ready to go. Right now I shouldn't be doing this, I should be stretching. She's super positive and looking forward. Both are great." Although his mother taught him the game, she does not serve as his coach. He worked extensively with Peter Lucassen before the former USC player began traveling with Steve Johnson, and still does when Lucassen is in Southern California, but has no particular coach right now. "I still hit with her sometimes, but not so much for coaching," said Holt. "She'll feed to me and stuff, but a lot of times to get her ready for an exhibition or get me ready for a tournament, or just because I want to hit some balls. So she's not so much a coach as she's always there for me when I need her. I mostly don't get advice on my strokes and things now. I just practice with the kids around, because there's a ton of good competition in California." Holt has committed to USC for 2016, so beating Wiersholm, who has already spent a year at national rival Virginia, was special to him. "I knew he was going to have all the pressure, because this was his last year, coming back from college and he has a lot of expectations," said Holt. "I knew he would be the one to get tight, and the times when I was supposed to get tight, I knew I had nothing to lose, deuce, break point, whatever. Up 4-0, I knew there was a chance he could still come back because on paper he is so much better than me, so I was just going to play my heart out. Even losing in three sets to him would be amazing, but I'm happy where I am and still want to keep going." Holt will play No. 12 seed Eduardo Nava, who defeated unseeded Ben Vandixhorn 6-3, 6-0. The 16s division produced the biggest upset to date, with unseeded Keenan Mayo defeating No. 2 seed Jake Van Emburgh 7-5, 6-3. Van Emburgh had lost the first set in his previous two matches, so Mayo was prepared for a possible third set. "That's something that me and the coach I'm with talked about," said the 15-year-old Californian. "He was kind of letting up if he got down early, so I tried to bring the intensity early on, and I did that well in the first. I kind of let up a little bit, but still stayed on top enough and was mentally confident enough that I pulled through." Mayo said the three-setters that Van Emburgh won in rounds two and three may have taken their toll. "We also talked about how his legs may break down after a set," said Mayo. "And I definitely saw a little bit of that in the second set from him." Having eliminated the No. 2 seed, Mayo likes his chances. "I had a lot of confidence coming in," said Mayo, who reached the final of an ITF Grade 5 in Canada last month. "I was playing some good tennis before this tournament and now that I've beaten the two seed, the draw's opened up a bit, so I'm going to try to win the tournament." 16s No. 3 seed Patrick Kypson has dominated in his three victories, losing only eight games total, and he handled the pressure of playing on George Acker court today against unseeded Caleb Chakravarthi, rolling to a 6-2, 6-0 win. But after an emergency appendectomy and 12 days in the hospital, a tennis match doesn't have quite the same significance it had for him earlier this year. "My appendix ruptured actually on the airplane to Guatemala," said the 15-year-old from North Carolina. "So we landed in Miami and I went to hospital and I had surgery. I got infections, because of the rupture. I was in the hospital in Miami for almost two weeks. That was the worst 12 days of my life. It was pretty scary. My dad (a cardiac surgeon) said I was pretty lucky to be alive after that." As for his match against Chakravarthi, Kypson said he was certain that his opponent was much less comfortable on the main show court in front of so many spectators. "Caleb hits the ball really well," said Kypson. "But I think playing on Court 1 in front of all those people really helped me a lot. I have a lot more experience in front of crowds and I think that favored me a lot more. I think he was pretty nervous in the beginning and I just took control of it." Kypson has set his goals high for this year at Kalamazoo. "I'm hitting the ball well, I like Kalamazoo, and I want to go all the way, I want to win this year," he said. Top 16s seed JJ Wolf advanced to a round of 16 meeting with No. 22 seed Kevin Zhu by beating Andrew Ton 6-2, 6-2. The doubles fourth round in both divisions produced four notable upsets. Top seeds Michael Mmoh and Frances Tiafoe were beaten by No. 9 seeds Alex Rybakov and Eduardo Nava 6-1, 7-6(4), and No. 3 seeds Tommy Paul and Henrik Wiersholm lost to No. 12 seeds Oliver Crawford and Johnathan Small 4-6, 6-2, 10-8. No. 2 seeds Taylor Fritz and Reilly Opelka now assume the favorite's role as the only Top 5 seeds still in the 18s draw. 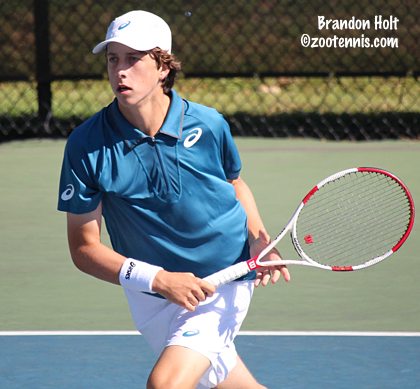 The top two seeds in the 16s division also went down in the fourth round. No. 14 seeds Jackson Allen and Carson Haskins defeated top seeds Jake Van Emburgh and JJ Wolf 6-3, 2-6, 10-4 and No. 2 seeds Trent Bryde and Patrick Kypson were defeated by unseeded Alexander Brown and Brady Draheim 6-1, 6-4. Complete results and Wednesday's schedule can be found at ustaboys.com.